The Build Project works with young people from Burma to strengthen their communities. Young people we work with have frequently experienced a life of poverty or instability which has restricted their access to education. We aim to provide opportunities to help young people redress the disadvantage they face as a result of forced migration, poverty or low social standing. We help them to develop relevant and practical skills which will enable them to become self-reliant and improve their opportunities in life. The young people we work aim to play an important role in the future of their communities. We aim to equip them with capabilities and skills so that they can themselves identify and address the needs of their communities and disempowered youth. In our work we promote trust and collaboration between the different ethnic groups from Burma, intergenerational dialogue, and greater awareness of the role of women in building communities. Our focus is on applied learning with real outcomes, such as community-oriented projects. 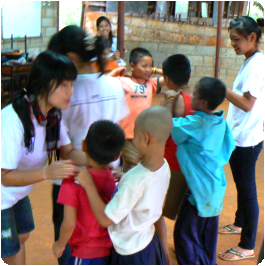 From 2010 to 2012, we offered a two year residential training programme at the Institute of Academic and Practical Studies (IAPS), for migrants from Burma aged 17-25 in Mae Sot, Northern Thailand. The IAPS programme evolved through consultation with a working group of prospective students. enable young people to improve their life chances. The Build Project Australia is an incorporated non-profit association based in Melbourne, Australia. The organisation is run by volunteers and is entirely dependent on private donations. We have no religious or ethnic affiliations. Students learn to explore their own goals and how they can reach them, and have input into decisions about the curriculum. At a remote rural primary school for migrant children, our students see how they can make a difference.